The Wideye™ iSavi™ terminal is the first and only satellite terminal developed for Inmarsat’s IsatHub service. The Wideye iSavi (aka IsatHub) Wireless Satellite Terminal turns your smartphone or tablet into a satellite communications device for phone Internet and texting! This new satellite technology allows your Apple iPhone, iPad, or Android devices to stay connected no matter where they are on the planet (save for the North and South poles). 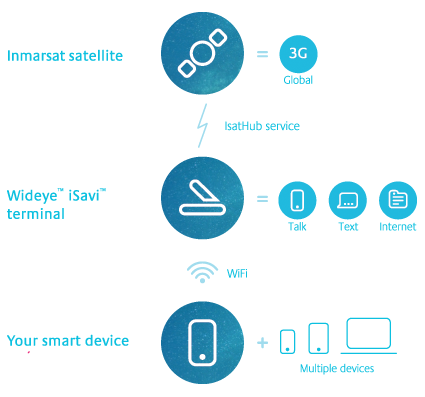 The iSavi uses the Inmarsat IsatHub network for global connectivity for any smart devices. Simply point the iSavi toward one of the three satellites using the intuitive pointing lights, and the iSavi connects with the Inmarsat network and starts a Wi-Fi network for your smart devices to connect to. Use all your apps that connect to the Internet. ￼ Talk, Text, Connect to the Internet from anywhere with your smart devices. Designed for Android, iOS (iPhone, iPad) smartphones and tablets with free downloadable apps. Global Coverage - click here for map. 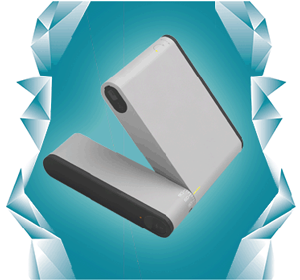 In addition to supporting full access to data speeds of up to 384 Kbps down, 240 Kbps up, in BGAN mode the iSavi terminal supports 32 kbps and 64 kbps streaming services. The Wideye iSavi will support any off-the-shelf apps that work over an IP (Internet) connection. Flip-up Antenna with visual pointing indicators. Weighs 850 grams (1.9 lbs). Up to 8 hours standby, 2 hours transmit (at max power 100% of the time). The iSavi is wirelessly accessed from your smart device through the control app downloaded from the Apple App store or Google Play. Check email, browse the web and use your smart device anywhere and anytime on the globe. Internet speeds are comparable to most cellular networks at 384 Kbps down, and 240 Kbps up. There are no wires or connection ports on the iSavi. The voice app enables you to use your smart device to make and receive voice calls via iSavi’s dedicated high-quality voice line, as well as text messages. A satellite telephone number will be issued to your smartphone that can be called by anyone on the planet. iSavi operates over the Inmarsat-4 (I-4) satellite and ground network, which operates globally, except for extreme polar regions, at an average availability of 99.9 per cent. The service is accessed via Control and Voice apps (available for download on App Store and Goggle Play) downloaded onto a smart phone or tablet. These 2 apps connect you to the 1-4 network via the iSavi satellite terminal that has been type approved to work over lnmarsat's network. The control app provides set-up assistance and gives you full control over access to the IsatHub service as well as visibility of data usage from each device sharing the iSavi connection. The voice app enables you to use your smart device to make and receive voice calls via iSavi's dedicated high-quality voice line, as well as sending and receiving text messages.